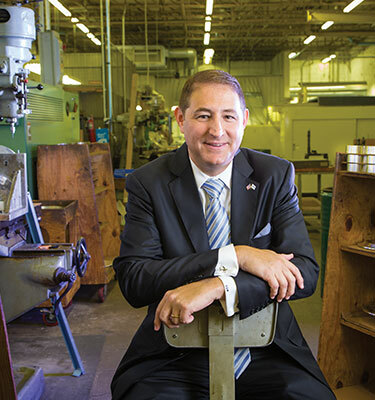 In the past 20 years, Mendelson and his brother Eric, guided by their father Laurans, have transformed HEICO Corporation from a money-losing venture to a highly profitable global aerospace and electronics conglomerate with more than $1 billion in annual sales. Along the way, Mendelson has helped fight off a $100 million lawsuit by United Technologies Corp. that would have closed the company’s doors and has negotiated more than 60 acquisitions. Today, HEICO (NYSE: HEI and HEI.A) has a $4 billion market cap, and analysts project sales of $1.3 to $1.4 billion this year. “Our compound annual return over the past 25 years has been about 23 percent—better than Warren Buffet’s investment in Berkshire Hathaway,” Mendelson said. Mendelson has served as HEICO’s co-president since 2009 and is also president of the company’s Electronic Technologies Group, whose net sales increased 46 percent to a record $132.6 million in the second quarter of fiscal 2016. “Our products are found on large commercial aircraft, regional, business and military aircraft, as well as on a large variety of industrial turbines, targeting systems, missiles, and electro-optical devices,” he said. Born in New York, Mendelson was 15 months old when his parents, Laurans, and Arlene, moved to Miami. He graduated from Gulliver School and then returned to New York City as a freshman at Columbia College, earning his bachelor’s degree in political science in 1989. His older brother Eric was already a student at Columbia, on his way to a bachelor’s degree in economics and an M.B.A. The brothers had already formed an investment company, and Mendelson was considering a law degree in preparation for a career in finance. In the early 1990s, Mendelson was living at home, juggling his law school assignments with the responsibilities of building a business. “We have a close family, and the company is intertwined in our lives,” he said. But Mendelson also paid close attention to his classes, particularly the corporate and security law courses taught by Professor Stephen Halpert. After he graduated, he returned to the law school several times as a guest lecturer on his experience at HEICO. Turning around HEICO was a long-term process—not like waving a magic wand. “We were able to do so by running a good business, taking care of our people, and developing products our customers needed,” Mendelson said.